BANFF, ALBERTA, Canada – The thrill of ice climbing in the Canadian Rockies is indescribable. Let Yamnuska Mountain Adventures, the top Canadian Rockies ice climbing guide company for over 30 years, take you on an unforgettable ice climbing adventure. Our experienced guides know the top ice climbing routes in Banff, Canmore, Lake Louose, Yoho, Kananaskis and Jasper like the back of their hands. Your world class Canadian Rockies ice climbing experience awaits! At Yamnuska Mountain Adventures, safety is a primary concern. All of our guides are certified through the Association of Canadian Mountain Guides or the International Federation of Mountain Guides Association (IFMGA). They use the latest technology available to predict avalanches and adverse weather conditions so you don’t get caught in a dangerous situation. All participants receive transceivers and complete safety instructions. Guides use the Yam Ice Exchange network to communicate with each other about possible risks so you stay safe on your ice climbing adventure. For ice climbing in Banff, Alberta look no further than Yamnuska Mountain Adventures. Our talented ice climbers, guides and instructors are there to ensure a safe and enjoyable Canadian Rockies experience that you won’t soon forget. We look forward to sharing the best ice climbing destinations in Banff National Park with you. 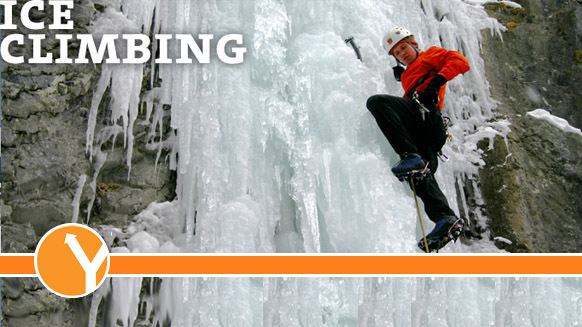 New to the thrilling sport of ice climbing? Be sure to take our Canadian Rockies Beginner Ice Climbing weekend course in Banff and Canmore. This introductory class offers personalized instruction to help you develop the essential basic techniques of ice climbing. And what better way to learn how to ice climb properly than to train with top ice climbing guides in Banff, Canmore and Kananaskis. Join Yamnuska Mountain Adventures for a fun, challenging and exhilarating ropes course tour 30 feet off the ground! With a series of obstacles and challenges from poles and trees, participants can complete the ropes course in a variety of combinations. It becomes even more fun and challenging when you ‘cross paths’ with other participants on a section. The ropes course is a great family or group activity that is challenging yet fun and playful. Complete all of the obstacles or only the ones you like. Do it on your own or work together as teams. However you choose to do it, the ropes course is a lot of fun. You complete the activity with a 70 meter zip line ride which safely returns you to ground level. If you’re looking for adventure activities in Banff, Alberta, Yamnuska Mountain Adventures has it all. This top Canadian Rockies mountain guide company offers you the best of mountaineering in the Rockies, Banff, Alberta rock climbing, backcountry skiing in Banff, ice climbing, and trekking in Banff, Alberta. Training and tours are available for all skill levels. Watch this Yamnuska Mountain Adventures video and see what ice climbing in the Canadian Rockies is all about! Join the top Canadian Rockies ice climbing guides for an unforgettable weekend that will challenge and inspire you! No experience is necessary for this beginner ice climbing course in Banff, Alberta. The ‘Plus Days’ add-on option lets you build on what you’ve learned and develop you ice climbing techniques under expert supervision. Don’t miss this spectacular Canadian Rockies ice climbing adventure!